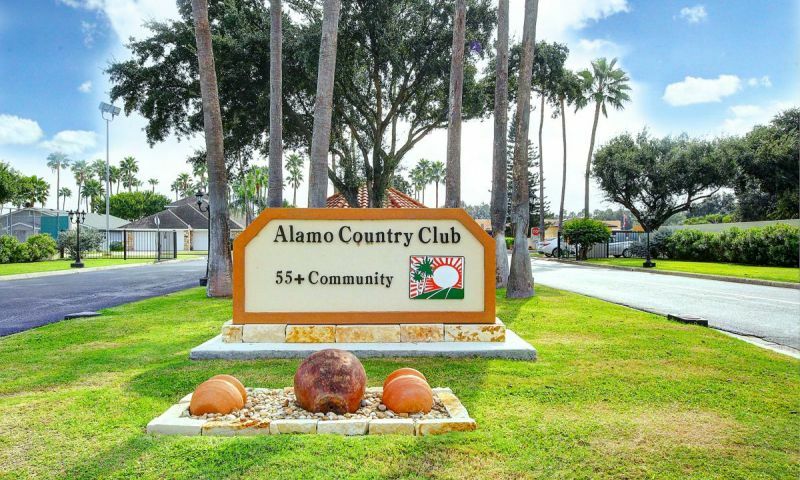 Alamo Country Club is a popular 55+ community in Alamo, Texas that is situated in the heart of the Rio Grande Valley area and conveniently located near many notable attractions in southern Texas. Boundless recreational opportunities, proximity to culture and a pleasant climate have been drawing retirees to the region for years. At Alamo Country Club, an array of lifestyle opportunities await. Golfers can enjoy the 9-hole golf course with a driving and chipping range while other residents at the Alamo Country Club will love the several clubs and activities that cater to all interests. At Alamo Country Club, residents enjoy the perfect blend of a community that caters to both socially minded and physically active residents. The clubhouse is the centerpiece of all activity. Here, residents gather with new neighbors, mingle with old friends and work out in a fun and relaxing environment. The beautiful facility boasts an exercise room, locker rooms, meeting rooms, a card room, library, catering kitchen and billiards room. Outside, residents of Alamo Country Club can take advantage of the southern Texan climate with an outdoor pool and spa. Active adults can also hone their game with two tennis courts, seven shuffleboard courts, horseshoe pits and a beautiful pavilion. Opened in 1981, the strategically designed 9-hole golf course provides golf for all levels of play. Golf enthusiasts can also take advantage of the chipping range, driving range and pro shop. For a more relaxing evening with your significant other, Alamo Country Club offers a network of walking trails with beautiful lakes, ponds and parks. Alamo Country Club began building homes in 1981 and was completed in 2001. There are 526 single-family homes within the community. Most homes feature open floor plans with at least two bedrooms, two bathrooms and a one-car garage. These homes were thoughtfully designed to provide homeowners with affordable low-maintenance living. Residents pay a homeowners association fee that includes golf, a secured entrance and upkeep of the amenities and community grounds. Life at Alamo Country Club is very active and provides residents with several clubs and activities. Residents can enjoy the company of neighbors with a low-pressure game of bingo, canasta, cribbage, dominoes, Mah Jongg or pinochle. More creative-oriented residents can join the art, drama or quilters club while special interest groups like bible studies, the garden club and the sunshine committee ensures that active adults will always have something on their social calendar. For trying a new exercise routine, Alamo Country Club hosts a dance club, games of water volleyball and a yoga class. Whether you are a golf fanatic, love to learn, enjoy playing games or exploring arts and crafts, there is something for you at Alamo Country Club. Alamo Country Club is in south Texas in the heart of the Rio Grande Valley and is situated on the southeast corner of Tower Road and State Highway 495 in Alamo. Alamo is just north of the Mexican border and a one-hour drive from South Padre Island. Nearby cities of McAllen, Mission, Edinburg and Harlingen provide excellent hospitals and a wide variety of restaurants, entertainment and shopping opportunities. The Santa Ana National Wildlife Refuge is a 2,080-acre natural preserve on the banks of the Rio Grande where there are unusual birds, mammals, butterflies and plants. The International Museum of Art and Science allows residents to get a deeper appreciation of the arts and sciences through exhibitions, cultural events and educational programs. You can gain knowledge at The Museum of South Texas History that features exhibits on the history of the Rio Grande Valley, as well as the rest of Texas. For farther travel, the McAllen International Airport is approximately ten miles away. Active adults in southern Texas will love the amenities, tight-knit community and charming area of Alamo Country Club. There are plenty of activities available in Alamo Country Club. Here is a sample of some of the clubs, activities and classes offered here. Alamo Country Club began building homes in 1981 and was completed in 2001. There are 526 single-family homes within the community. Most homes feature open floor plans with at least two bedrooms, two bathrooms and a one-car garage. These homes were thoughtfully designed to provide homeowners with affordable low-maintenance homes. Residents pay a homeowners association fee that includes golf, a secured entrance and upkeep of the amenities. Please Note: Floor plans are not available at this time. ACC is the best kept secret in the valley. Great single family homes. Super amenities. Active community with lots of friendly neighbors and a happy support staff. Lovely community in a great location, close to the freeway, restaurants and shopping. Great clubhouse and the golf course is in great shape every time I visit! This is such a great place to live and retire. Golf is great but I do not play (my husband does). I love the other amenities and use the pool often. There is so much to do. The area has everything you need. Great restaurants, shopping, some of the best doctors & hospitals, nature parks, concerts, etc. and we are a short drive to the beaches of South Padre Island. The community is so active you can be busy every day or you can just enjoy the warm weather from you own back yard. The most important thing is the friends & neighbors that you find here. ACC is a great community full of FRIENDLY people. I don't care about how fancy the houses are or how extravagant the amenities are, I want nice neighbors. The amenities here are nice (not the best) plus golf is included so that is a great perk. We have been homeowners in Alamo Country Club since 2005. It is truly the "BEST KEPT SECRET IN THE RIO GRANDE VALLEY OF TEXAS" We own our own brick home on our own ground and are part owner of the 9 hole par 35 golf course. The home owners association has a $500,000.00 reserve in the bank as well. We can golf 6 days a week if we wish, swim in the large swimming pool and exercise in the state of the art exercise area. We take advantage of many of the over 40 activities offered in the club. My wife, Lynne and I can honestly say if it were not for Alamo Country Club we would most likely not be here in south Texas. We feel very secure inside our gated community since it has 24 7 security at the main gate. We highly recommend you come take a look at what Alamo Country Club has to offer. 55places.com is not affiliated with the developer(s) or homeowners association of Alamo Country Club. The information you submit is distributed to a 55places.com Partner Agent, who is a licensed real estate agent. The information regarding Alamo Country Club has not been verified or approved by the developer or homeowners association. Please verify all information prior to purchasing. 55places.com is not responsible for any errors regarding the information displayed on this website.